Classic midcentury Danish design with a touch of style Measures: 19 cm dia 4.5 cm. A lovely classic pair of Art Deco candleholders in what appears to be copper Pressed base and decorated with 3 bows Very attractive patina. Vintage brass oil lamp handmade in Denmark and designed by Ilse Ammonsen Adjustable height and a self leveling gyro function Engraved on the base “Ilse Ammonsen”. 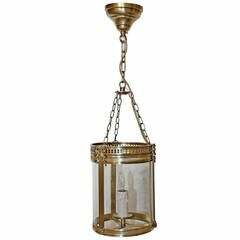 Early 20th century cast brass hall lantern with glass encasing 4 lights. We will supply 3 feet of chain and canopy. Made in Europe, circa 1920. 17 inches wide x 36 inches height. 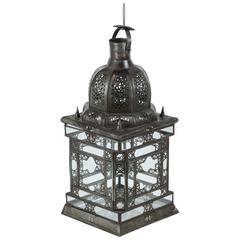 A slender 3 1/2 foot glazed hexagonal copper and brass hall lantern. With door for access to change the light bulb. Wired for electricity. A fine quality 1950s glazed cylindrical brass hall lantern, with 3 internal lights. Re-wired.